Glow, day and night, our passion, our profession! Welcome to the market leader! – State-of-the-art encapsulation technology coupled with modern and efficient manufacturing assets and lean operations capable of delivering best-in-class fluorescent pigments at competitive cost. 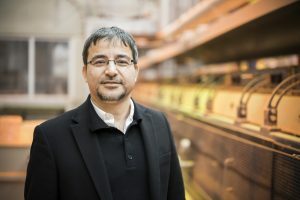 – Unique fluorescent ARAPLAST-melting pigments permitting coloration of thin olefin based films in single and multilayer packaging. – Next generation ARAQUA & ARAGEN-chemistry enabling unprecedented light stability of formaldehyde-free fluorescent pigments without compromising other performance attributes. 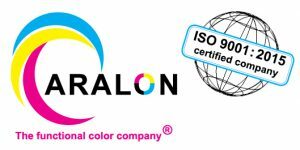 ARALON COLOR is an independent, ISO 9001:2015-certified specialty chemicals company based in D-56412 Heiligenroth (state of Rhineland-Palatinate), directly at motorway A3 in between Cologne and Frankfurt/M.. 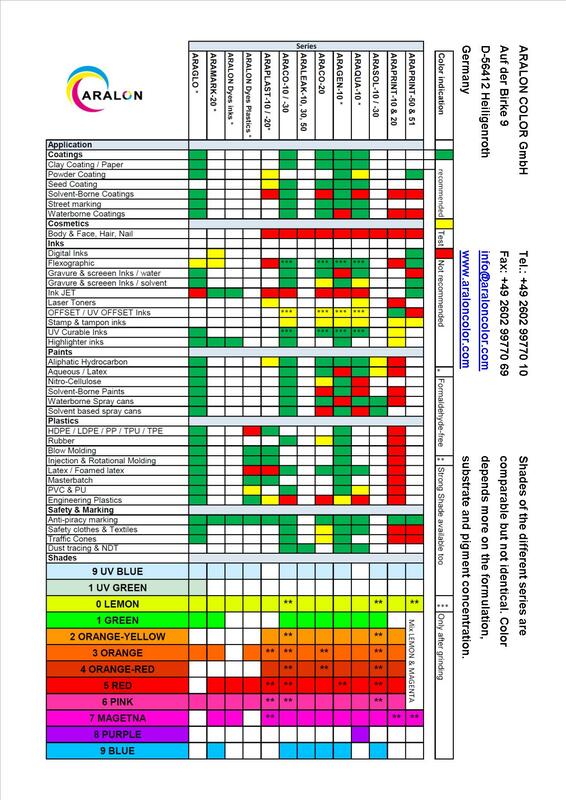 In a market that has not experienced any significant development or innovations over an extended period of time, in which strategic engagement and investments have been cut back and knowledge has depleted, ARALON COLOR considers itself protagonist of a new era of sustainable, application oriented developments in the area of luminescence and functional colorants. In 2013 we began development, production and sales of daylight fluorescent pigments for paints, printing inks, aerosols, plastics and many other applications at our newly built plant. Since then we have added fluorescent dyes, long lasting phosphorescent pigments as well as organic specialty pigments and dispersions to our offering. ARALON was derived from the ARA, a big and colorful parrot. The wonderful and bright colors of the parrot’s feathers are the result of light refraction through nano-size holes in the natural polymer structure of the parrot’s feathers. Depending on hole size and number of feather layers the human eye sees an unlimited number of bright and colorful shades of light, which appear to be the color of the feathers themselves. In many ways this is relevant to our company too. 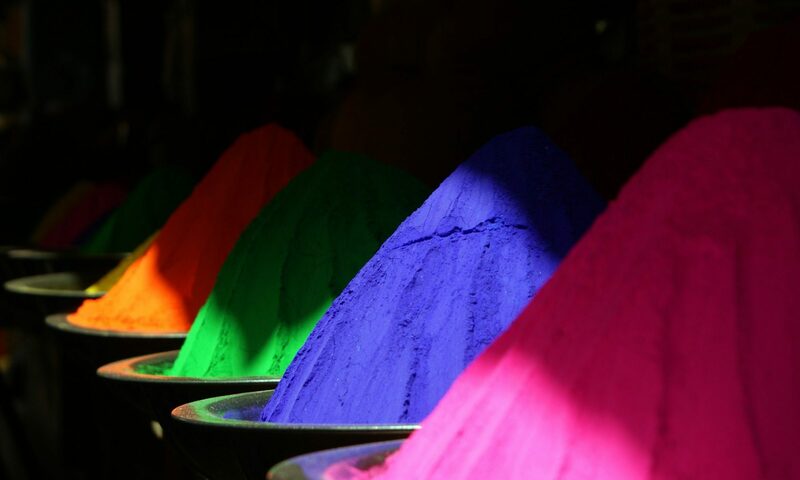 As we strive for better functionality, bright and pure colors, we are also looking at more creative ways to make our pigments more sustainable. In this sense the ARA is not only godfather, but guiding principal of our R&D efforts. Today special effect colors are being used not only for their decorative appearance, but for their functionality in safety, marketing, marking, testing and tracing. ARALON COLOR will support you creating effective and sustainable solutions in the area of luminescence. JMB James M. Brown Ltd.
Ravago Chemicals Kemiropa Kimyasal Hammaddeler Satis ve Pazarlama A.Ş.